Generally, we here at the PF find golf “accessories” to be unnecessary. We all know “that guy” at the range with the staff bag and matching “tour” uniform (complete with white belt). On the other end of the spectrum, there is “that guy” with everything including sharpie, bag tags, ball cleaner, towels, beer dispenser, groove sharpener,ball retriever, cigar holder, portable disco ball, and stereo system dangling from his 14-way cart bag that it looks like a Christmas tree. I say this, and look over at my own bag with a towel, bag tag, and brush hanging off the side… In any event, there is one “accessory,” however, that never seems out of place. We see the pros using them on TV every day, but really don’t think twice about it until we wish we had it. 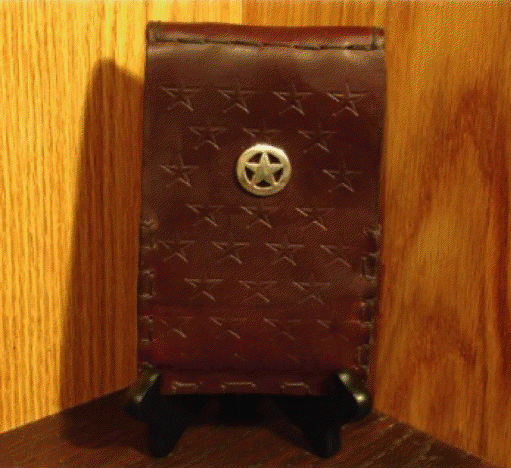 The scorecard holder. Today, we review a golf necessity that truly stands the test of time and is worthy of any true golfer’s bag – Stanley Mayhem Scorecard Wallets. 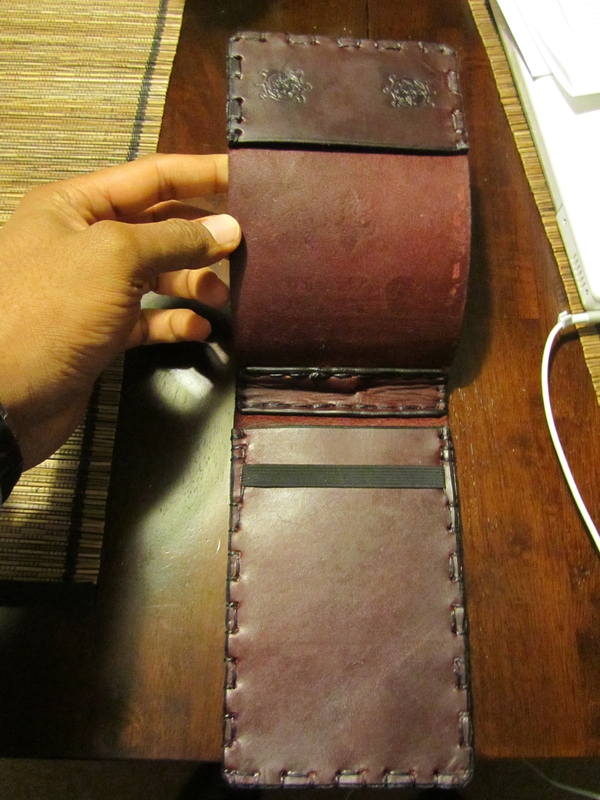 Greg, the designer and manufacturer of these beautiful wallets, makes a wonderful product. Above is an example of one of a pair of custom-designed scorecard wallets that he worked with me on in record-breaking time. I must say, he was was great to work with. 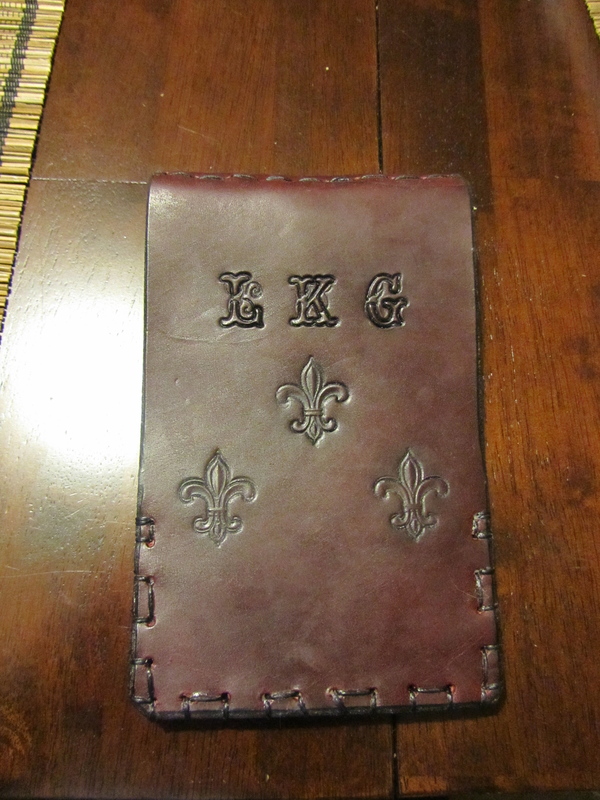 He took my totally unreasonable request to make these wallets in a half his usual time and made it a reality. A quick story: I had planned a trip to ATL to spend some time with JK and play a course (to review for this blog). 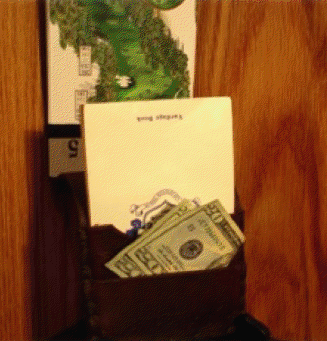 I wanted to have these wallets as a thank you for getting us out to the course, but the plan eventually fell through. In any event, Greg was very accommodating and had the wallets in my hands prior to when I was scheduled to leave for ATL. 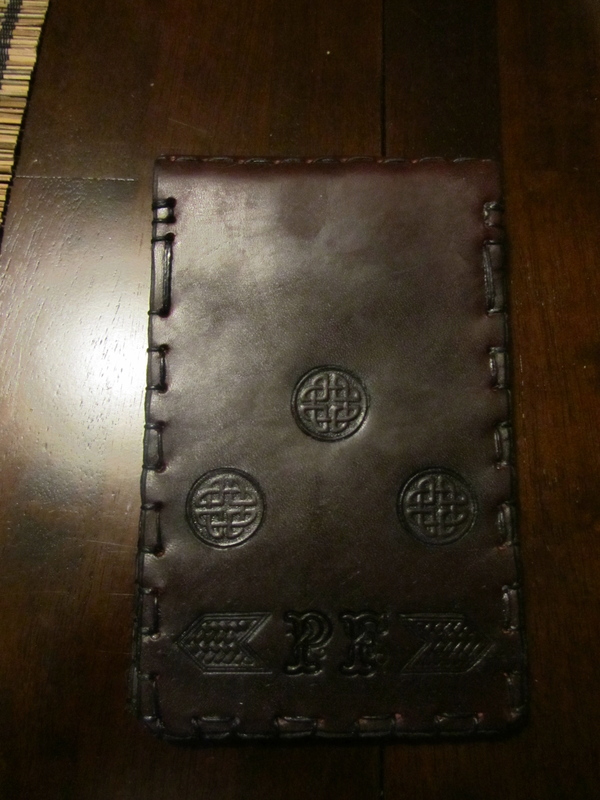 This picture is a little darker, but I wanted show the depth of the color of the dye used in this wallet. It is a very rich dark brown color. The letters on the bottom are “PF” for this blog. This particular model is called the “storyteller.” Other models include multiple pockets, custom insignia, and other amenities. I just wanted a basic model that used elastic, had a pencil holder, and provided a solid writing surface. The interior pocket on the flap is nice a nice bonus; I use it for holding my NCGA cards and a small amount of cash for on-course refreshments :). Greg was nice enough to add a customization to the interior pocket – the two turtles. This was a shout-out to JK for something he said one of the first time we played a round of golf together as summer associates. Other options include choice of colors of leather: Bison Brown, Charcoal Black, Scarlet Red, Forest Green, Deep Blue, Sunset Orange, Natural, and Deep Purple. Greg notes that each wallet is dyed three times and sealed to prevent leeching of the dye onto clothing. He cautions that the wallet should not be used in light colored clothing the first few times that you use it, but I never had an issue with leeching. Once you make the very difficult decision to forego picking up a belt from Greg as well, he makes the process very easy. Send him an email (greg.dibble@yahoo.com) with your idea and he’ll draw up an electronic design for you. You make any changes, and wait until Greg hand makes your custom design. 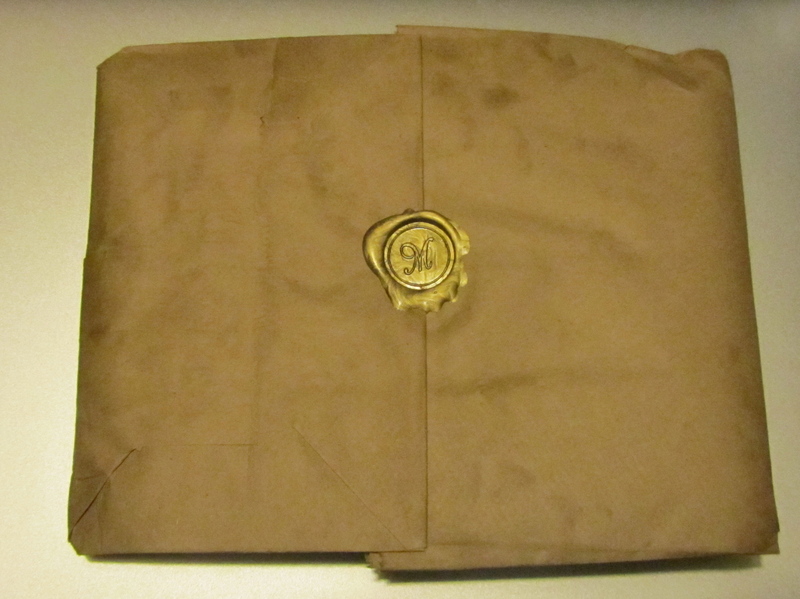 Once your design is complete, Greg packages it up (very nicely, i might add) and ships it off to you. It’s that simple. Last week, JK and I had a talk about possible ways to help me improve my ability to hit greens in regulation. At that time, I was hitting my irons crisply and to consistent distances, but was still having problems controlling trajectory. This resulted in a lot of greens missed but with the ball pin high a few yards off-line. My problem was becoming more pronounced in the windy conditions I typically face in Northern California. After shooting a career round the previous Saturday, I sat down and evaluated my round. Of the 8 greens I missed, 5 were missed left, two long, and two short. The three misses to the right were with wedges, or were from the left rough. My miss, clearly, is left. On windy days, the little draw I have become accustomed turns into something between a hook and a duck hook. 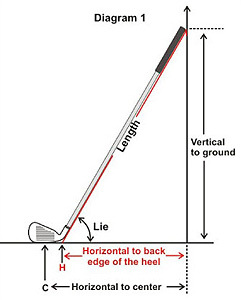 As shown, if the club is too “upright,” that is, the lie angle is such that the toe of the club is raised relative to the heel, the player will tend to miss left (left side of image). This makes sense because if the heel of the club is lower than the toe, it will make contact with the ground before the toe, causing the head to close through impact. If the club is too “flat,” that is, the heel of the club is raised relative to the toe, the player will tend to miss right (right side of image). This also makes sense because if the toe makes contact with the ground before the heel, it will tend to be dragged behind the heel and push the ball to the right. When the club is properly soled, it gives the golfer the best chance for making solid contact and hitting a straight shot. Small differences can be huge. For some reference, the total amount of variation in lie angle for any clubs is about 4 degrees flat to 4 degrees upright. With all of this knowledge in mind, I decided to get the lie angles checked on my irons by a competent professional. My first stop was a big box store in San Jose. As is custom for fittings in such a store, the bottom of my club was taped up with tape that shows where contact was made with the ground. A plastic lie board was setup with a ball, and I hit a series of shots to determine what part of the club was making contact with the ground. So far, so good. Once we had determined that the lie angles on my clubs were too upright for me, the “clubmaker” at this store took one look at the results from one club and said all of my clubs needed to be bent “at least one degree.” The big box store also wanted to charge me $5.99 per club to have them bent. I’d need to leave my clubs with them for a week as well to have this process performed. If the clubs were not right when I got them back, I’d have to tell them what adjustment was necessary and wait another week. Thanks, guys, but I’ll go somewhere else. Enter Brian Razzari. I called the Brad Lozares Golf Shop at the Palo Alto Municipal Golf Course on my way home from San Jose. I should have called here first because I was looking for someone that actually knew what he or she was doing. Upon answering, Brian was completely accommodating of my ridiculous request to come in within the next 30 minutes to have a lie fitting performed. He quoted me the very reasonable price of $50 to have the lie angles on each and every one of my irons and wedges (10 clubs total) adjusted based on a dynamic fitting he would perform at the driving range. He would watch me hit a few shots, take the club, bend it, and watch me hit more shots to determine the correct lie angle for each club. This is tour-level fitting, people. Brian also checked the lofts on each of my irons to make sure they were consistent. I also learned that Brian is a certified Titleist club fitter. He knows my AP2s better than most in the Bay Area. After about 45 minutes of hitting balls and bending clubs, Brian informed me that he bent my irons 2 degrees flat, wedges 1 degree flat, and did not adjust my 60* wedge at all because the sole already showed that it was at the correct lie angle for my swing. I am not sure I can say enough good things about the experience with Brian, but if you are interested in making your game better, I highly recommend getting your clubs fitted to your swing so that you don’t start making compensations in your swing to make up for an incorrect lie angle. If you are in the Bay Area, I highly recommend a trip to Palo Alto Muni to visit Brian Razzari if you want a tour-level fitting experience for a reasonable price. Palo Alto Muni: http://www.bradlozaresgolfshop.com/ or call 650-856-0881 and ask for Brian. In yet another joint post, LG and I review a place near and dear to both our hearts, the Robert Trent Jones Golf Trail–specifically, the course at Oxmoor Valley. Nearly two years ago now (Summer 2010), LG and I visited the RTJ Golf Trail for a 3-day trip through Alabama to play three sites of one of the most fun golf experiences in the Southeast, the Robert Trent Jones Golf Trail (see www.rtjgolf.com) (Note: given that this was our second trip, the photos below will show the course at two different times). Although there are a number of trips in the Southeast that I am looking forward to taking some day (Pinehurst and Sawgrass to name a few), the RTJ golf trail is both reasonably priced and easily accessible (relatively) for both LG (who has relatives in Mississippi) and me (Atlanta)–in particular, the courses in Birmingham, AL. Oxmoor Valley is one of two RTJ sites in Birmingham, the other being the Ross Bridge course. However, we have not played the Ross Bridge course because it is easily 3x the cost of playing the Oxmoor Valley, and, although we’re fanatical about golf, unnecessary cost doesn’t equate to greater value. As previously mentioned, LG and I have visited multiple RTJ sites. 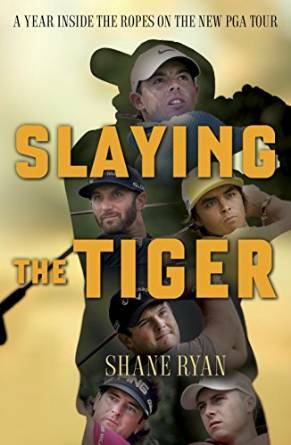 For the price, there is little that is comparable to RTJ courses. For those that don’t know, Robert Trent Jones designed golf courses are typically long, undulating, and punshing while maintaining an understated elegance and natural beauty. 430+ yard par 4s and 3-teired greens are just some of the common elements of an RTJ course. But when he gets a hold of an excellent piece of real estate–as he’s done throughout Alabama–RTJ manages to produce excellent golf. And the courses are well-maintained, even in the winter and the dog days of summer. What’s more, most RTJ sites include multiple golf courses in one site. Oxmoor Valley includes 36 holes of full-length golf and a par-3 “short course” that provides an excellent challenge. When LG and I visited the RTJ course several years ago, we opted to play the Ridge course and the Valley course in the same day. Halfway through the Valley course, we left and went back to the Ridge. I have played about 130 holes of RTJ Trail golf (27 at Silver Lakes, 45 at Capitol Hill, 27 at Oxmoor, and 30-ish at Grand National, not counting short courses), and the Ridge course at Oxmoor Valley may be my favorite of all. First, the clubhouses at all RTJ Courses are large and inviting lodge-type atmospheres, complete with full restaurants that serve very good meals to hungry patrons. The structures are adorned with memoirs of the great times one has playing golf and reminders of the history of the game. A view from the first green back toward the tee at the Ridge course gives a great idea of what lies ahead. Rolling hills, meandering tree lines, green fairways, and precise layouts make shotmaking in critical demand for a good score. The visual obstructions often make tee shots intimidating experiences, seeing how many places one can miss the fairway. Still, little matches the natural beauty of a well-planned golf course, and RTJ has plenty of that. Yet another indicator of the beauty of this course is seen at the par 5 3rd hole. A brave driver can place his ball in the fairway between the water. Even if you manage to hit a career drive, RTJ leaves very little payoff. The uphill second shot to a pedestal green is an unlikely reach, even for the longest and most precise hitter. What might be the signature hole of this course, the par 3 8th, is downhill and all carry over water. A nicely hit 7 or 8 iron (depending on pin location) will put you in a good spot for a birdie. A quick story from LG here: We have had two chances to play this hole in our time. During our first trip, the pin was located in the back right section of this green, and during our second, it was located in the front left location. During both trips, JK somehow managed to stick his ball in a position to have the longest putt imaginable on this green. I think he would have had about 5 feet of putts total left had the pins been swapped. I, on the other hand, have played this hole in even par for my career thanks to two nicely placed shots that left me a grand total of about 25 feet of putts on this green in two rounds. The closeup of the green below allows you to see this for yourself. Now back to JK. As my memory serves, I don’t recall thinking this course was very long. Yet, at over 7,000 yards from the tips, no one can call it a short course. I suppose I was too focused on other features of the course to worry about the length. Although I haven’t seemed to play well, I can’t blame the course at all for that. Quick aside from LG: JK might not be able to blame the course, but I’ll definitely throw in a complaint. RTJ designs a hard golf course. I love them and would love to have one be my home course some day, but man, they can kick your tail. A quick example is the dastardly par-4 6th below. The dogleg left hole measures 447 yards from the tips and requires a massive carry over a ravine. The more that I think about this behemoth, the less terrible I feel about making a quadruple bogey 8 on it during our last outing. The carry must be long and precise. The fairway slopes left toward the ravine and it is impossible to tell from the tee where the fairway comes out to save an errant ball. Moreover, the ravine cuts across the hole and makes any approach from the right rough a tall order. Oh, and even if you hit that monster drive, heaven help you if you have anything longer than a 7 iron in because this three tiered green demands a high, soft shot to get within range. Missing the green on any side, long, or short will provide a daunting up and down. My advice: play this hole as a par 5, or hope that your karma is better than mine. In two rounds, I am collectively 7 over on this hole alone. Now back to JK. The drawbacks–it’s hard to say. The courses are not really walkable not only because of undulation but also because there is a lot of distance between greens and tees. They are typically out in the middle of nowhere, but Birmingham wasn’t bad at all. Not to mention, when you’re golfing, you typically don’t want to be in an urban center. The service is great. The cost is reasonable ($52/18 holes with cart). One thing, you may want to check and ensure that maintenance is not being done during your trip. LG and I had planned to play one RTJ course during our 3-day visit that we skipped because it was being aerated during our visit. Thankfully, we checked when we called ahead–not sure they would’ve told us if we hadn’t asked. All in all, though, it’s a great place to play golf.